The 9DOF MPU-9150 is the world’s first 9-axis MotionTracking MEMS device designed for the low power, low cost, and high performance requirements of consumer electronics equipment including smartphones, tablets and wearable sensors. And guess what? You get to play with it. 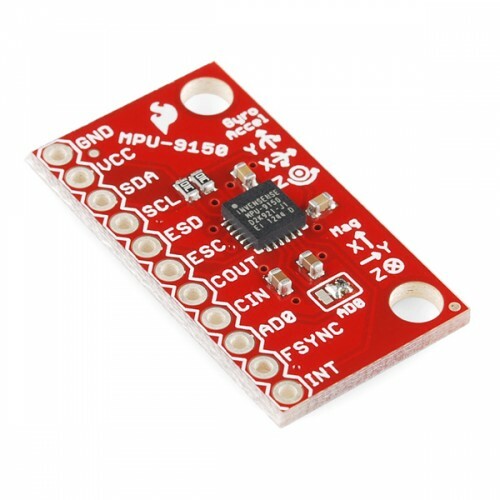 The MPU-9150 is a System in Package (SiP) that combines two chips: the MPU-6050, which contains a 3-axis gyroscope, 3-axis accelerometer, and an onboard Digital Motion Processor (DMP) capable of processing complex 9-axis MotionFusion algorithms; and the AK8975, a 3-axis digital compass. The part’s integrated 9-axis MotionFusion algorithms access all internal sensors to gather a full set of sensor data. The part is offered in a 4x4x1mm LGA package and is upgrade-compatible with the MPU-6050 integrated 6-axis MotionTracking device, providing a simple upgrade path and making it easy to fit on space constrained boards. I2C Pullup Resistors populated on board.